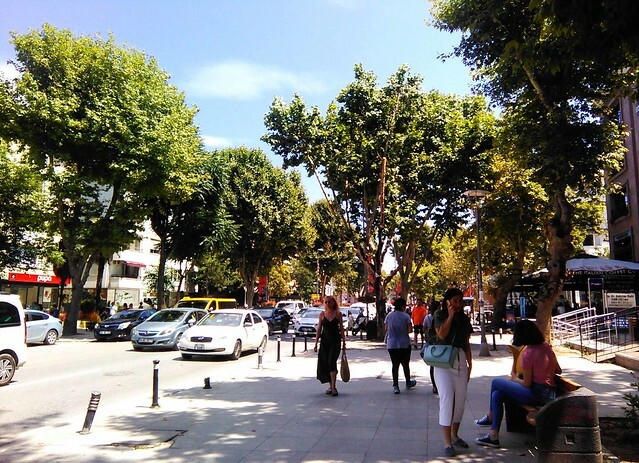 On a beautiful late Sunday afternoon, I went on a soundwalk in two Istanbul neighborhoods. The first was Küçükyalı, where I live. There, I conducted my soundwalk in a lush public park at the center of the neighborhood. 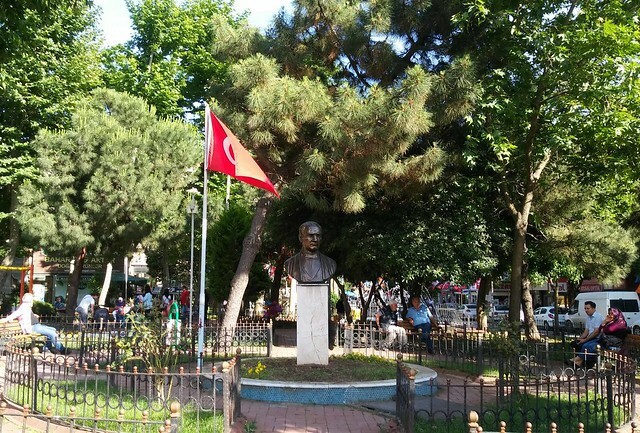 The park lies between a residential and commercial area and is adjacent to the highway connecting the East and West sides of the Anatolian half of Istanbul. 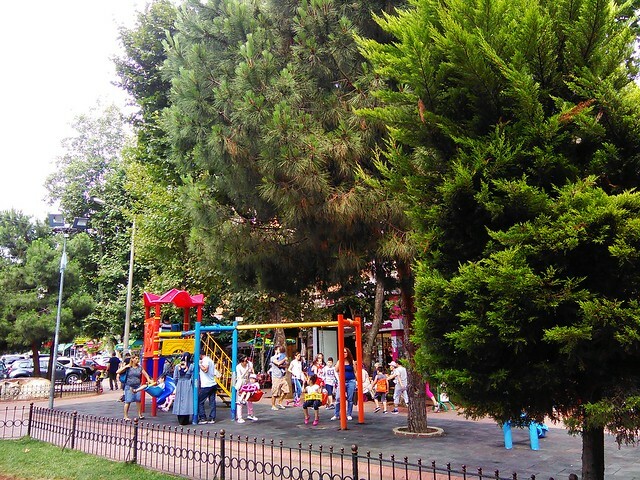 It is surrounded by small shops and often full of people sitting on benches watching children play in the nearby playground. In my walk through the park, I heard passersby chatting, children talking and screaming as they played, motor vehicles whizzing by, water flowing from the enclosed fountain, a cool breeze, and buzzing birds. Gentle and harmonic, evoking feelings of safety, these sounds made me want to spend more time in the place, enjoying the soundscape. My second soundwalk was in the neighborhood of Caddebostan, on a main commerical corridor called Bagdat Avenue, where I spend a lot of time. Another peaceful neighbourhood in the Anatolian side of Istanbul, Caddebostan is close to Kadıköy, one of only two commercial centers in Istanbul. Bagdat Avenue is lined with shopping malls, department stores, and standalone shops of global luxury brands. Both sides of the street have wide sidewalks, benches to sit and rest on, and refreshment stands selling newspapers and magazines, snacks, and drinks. In Bagdat Avenue’s soundscape, the voices of shoppers and passersby are overshadowed by the sounds of motor vehicles. The personalities of both sites’ comes through in their soundscapes. While Küçükyalı is a relaxing place to spend time, Bagdat Avenue is a more hurried space, a place to do what you need to do and leave. Despite their differences, both sites are important to life in Istanbul and they have rich histories and face current tensions that werent audible in my soundwalk. As is the case in many cities throughout Turkey, Bagdat Avenue and Küçükyalı currently face the threat of urban renewal. Urban renewal is increasingly used in Turkey by the government to impose dictatorial and monotonous policies on cities. This leads to disastrous outcomes in terms of social equity and living conditions. Urban renewal is detrimental to the physical and historical landscape. And, it gives no credence to sustainability and aesthetic values like human scale design. Despite the opressive nature of the government’s urban renewal policies and the lack of information available about such projects, a few glimmers of hope exist. One, in direct opposition to the information gap, is an online effort that tracks urban renewal related dispossessions. Another is a tremendous idea proposed by Sunay Akın, a Turkish Artist and founder of the Istanbul Toy Museum and Düştepe Game Museum. His vision is to turn the stations of the old Bagdat railway into museums and cultural centers. I would love to see this project come to fruition as it would preserve urban memory, activate these spaces, and help to enrich the city’s soundscape. 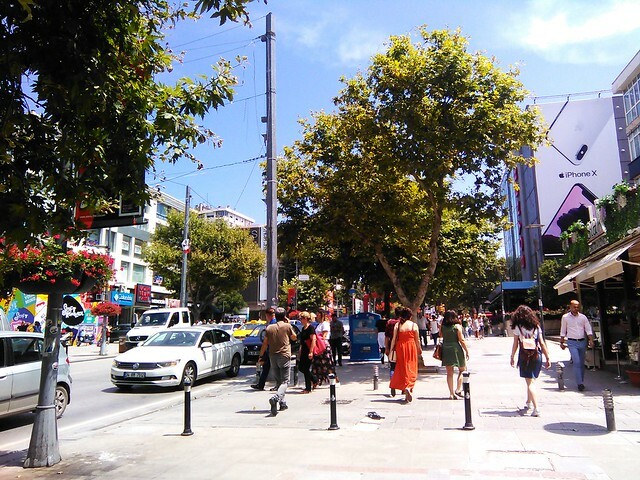 This is one of many posts where CoLab Radio contributors take readers and listeners on a soundwalk in their city. Read and listen to the previous soundwalk in the series soundwalk from Richmond, Kentucky here. If you’d like to submit an example from your own city, see the easy steps here.